If you are a Samsung device Android phone user, there is a bit of good news thanks to a leak over at Times News in the UK. According to a post they have made today, it looks like several Samsung devices are going to see Android Marshmallow soon – like as soon as next month. According to the post, The Galaxy Note 5 and the Galaxy S6 Edge+ will both be seeing the Marshmallow update in December while other devices will be seeing the update in January. The good news is that it is a pretty comprehensive list of devices. 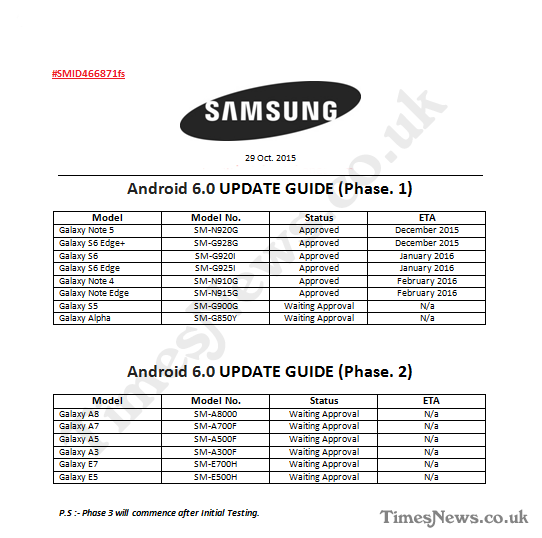 Here is a rundown of when you can expect Android Marshmallow to hit Samsung devices according to the leaked document. If this holds true, there could be a lot of devices that see Marshmallow within the next 2-8 weeks from Samsung, a rate that will eclipse the rate of the Lollipop update by a high rate of knots. Obviously there is always a bit of skepticism when it comes to leaks and this one should be greeted with such a view. After all, plenty of documents and rumors have been released in the past on devices and updates that have either been wrong or way off on the timelines.